Schist happens. Anadarko struck it off Taiaroa Head along with some hardrock granite, sand, clay and, as Anadarko have now publicly confirmed, no commercial quantities of oil or gas. For their trouble they clocked up a bill of around $300 million in NZ’s deep ocean. It was a somewhat inglorious (ignoble) retreat for the Noble Bob Douglas, Anadarko’s hired drill ship, first with an on board leak about the ‘no-find’, and then the ODT reporting selected Dunedin meetings which mysteriously disappeared a day later, but which we now know did occur. Anadarko’s NZ CEO Alan Seay explained how to decipher his announcements this week as reported in the ODT: No Gas but Hunt Goes On. His line a week ago that “detailed laboratory testing would be needed to confirm what had been found” actually means “Nothing found”. Thanks Mr Seay. Now we know. Not only do we have to decipher the usual company spin but also announcements that don’t mean what they say. 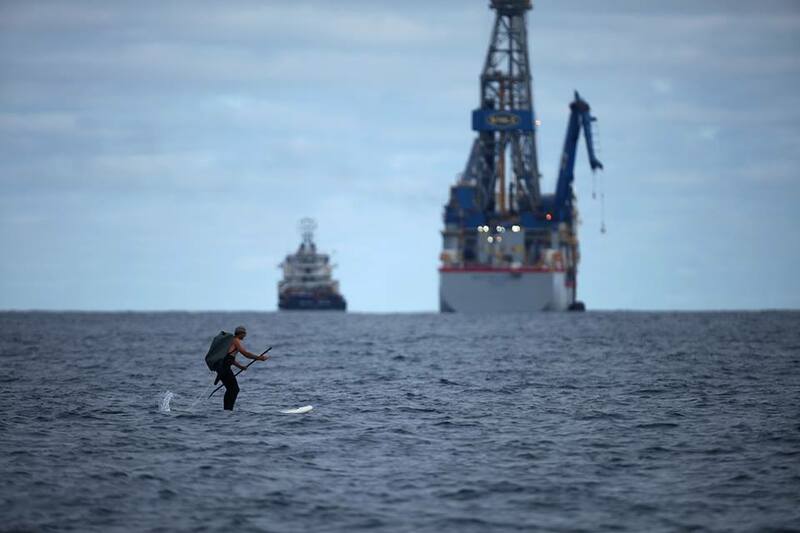 Oil Free Otago’s message to Anadarko, regardless of what they found, is TIME’S UP for deep sea drilling in Aotearoa. It’s time for clean energy! We hung that message on the Railway Station clock tower last week just to make it clear to the few slow learners in town, and to our backward-looking government. Check the video of the Railway Station Clock Tower Action on YouTube. The clock tower action, by Oil Free Otago, Oil Free Otautahi (Christchurch), Clean Energy Action (Nelson) and Greenpeace NZ, was on behalf of the many thousands of New Zealanders who came out on their beaches over the summer to say no to Anadarko and deep sea drilling. We’re ready to start our clean energy future now. The transition to renewables is the other side of the same campaign and it’s nice to have the opportunity to shout yes instead of no! But first, we’re having an Adios Anadarko PARTY! Waitati Hall Sat 12 April, 7pm till late. Featuring Erin Crowley, Tahu and the Takahe, Bell and others. All supporters and ready response team members warmly invited. Let’s give that two-bit Texan a good send-off! Shell’s profits dropped 71% at the end of last year and new CEO Ben van Beurden has made big changes since. Among other things they’ve sold their refinery and retail networks in Australia and won’t be back to the Arctic this 2014 summer. Arctic drilling has cost them $5 billion so far and was “under review” amid negative campaigning from green groups. See? What we do counts! Shell seem to be putting their money on gas – the ‘clean’ fossil fuel, right…? Wrong. Burning gas releases around 75% the CO2 emissions of crude oil. It’s the filter-tipped cigarette version – does the same damage, just takes a little longer. With no royalties coming to the regions either, there’s very little in it for us. Oh, except the risk, its direct contribution to climate change and the taxpayer money we have already forked out to the oil and gas industry, $46 million last year. Shell have been conducting seismic testing in the GSB over the summer and are predicting they will be ready to drill their first exploratory well early in the summer of 2016. We’ll be ready. NZOG (New Zealand Oil and Gas) have also been seismic testing off the coast between Dunedin and Oamaru this summer at an estimated cost of between $8-10 million or $300,000 a day. They say they now have around 18 months of analysis before deciding whether or not to drill. Their CEO Andrew Knight has been in town saying he wants to build trust in the community. This is the man who has just taken the “What Lives Down Under” roadshow into Taranaki schools, marketing the industry to children and calling it science. See our blog More Marketing than Science. The Otago Regional Council told the St Martins Island community into take down the NO DRILL sign on their jetty, claiming it was advertising. The ORC Regional Plan requires the council to “meet the social, economic and cultural needs of the people and communities of Otago, now and in the future.” Instead the council have caved in to business interests and refused to go to mediation with this small community. The islanders chose to take the sign down themselves on Anadarko’s departure because they are ready for a new message. Their experience with the ORC has made them more determined than ever to continue their work against deep sea drilling and towards a low carbon future for the sake of a stable climate for future generations. They say there will be further action. – Make a submission to the DCC Draft Annual Plan – even if it’s only a few lines – to say your council should NOT be investing in fossil fuels – on line submission form. – We are collecting clean energy stories from innovative people and businesses in Dunedin – contact us if you have some to pass on. – Keep writing letters to the editor, opinion pieces, on line comments etc. They are having an effect! Hasta pronto at the party! Oil Free Otago has been a recipient of a @Radical Action Grant. These Grants support radical grassroots environmental activism – especially climate activism – in Aotearoa. Aimed at groups less able to access conventional sources of funding, the grants go to inspirational and thought-provoking projects that work on a shoestring budget. If you’d like to donate to Radical Action Grants to support other awesome groups, here’s the donate page.